Have you ever used fondant on a cake? I have. Several times. In the past, I had only ever used the store-bought junk. You know the stuff, hard as a rock, tastes awful, not to mention, expensive! I never attempted making it myself. Simply because I envisioned a massive, Spider-Man-style, sticky web of half-formed fondant-goo, stretching out to every surface in my kitchen. I would be trapped inside this web. And clearly the fate of anyone attempting help or rescue would be the same as my own. I wasn’t willing to risk certain doom for myself and my family. My precious boy who believes that mama can do anything. My Bear. My beautiful baby was about to turn five. And his birthday party was to be a pirate-themed pool party. He was snuggled oh-so-sweetly next to me as I was perusing the interwebs for birthday cake ideas. 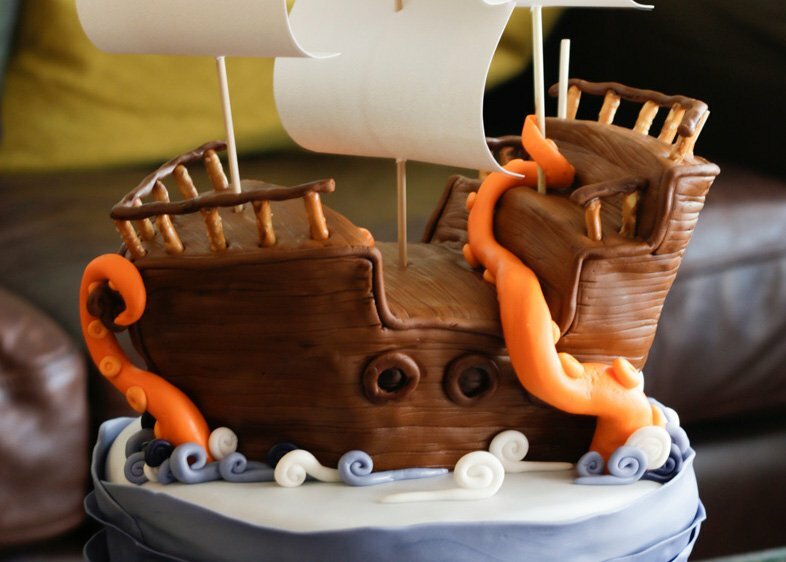 That’s when he saw a pirate ship cake. In an instant, his mind was set. It was the cake of his dreams. Defying gravity and clearly made by a professional. I tried to sway him. “Ooh, honey, look at this one. It’s a treasure chest with gold coins …” (“and it’s a rectangle,” I thought to myself). My attempts were futile. The boy had his heart set on a sculpted masterpiece, and had no doubt that his mama could make it. Oh my sweet boy. I’m not looking forward to the day when your eyes are opened and you realize that I can’t do everything. But until then, I’ll continue to try. I think it was his unwavering belief in my ability that convinced me. But after staring at pictures for a long time, I had a game plan. First, I would need fondant. And lots of it. Forgetting how expensive that junk is, I made a list of the different colors I’d need and headed to the store. Then, realizing I’d be spending about $60 on this disgusting, crumbly, brick of disaster-waiting-to-happen, I promptly changed my mind. Instead, I walked out with two bags of mini-marshmallows and two bags of powdered sugar. I read several recipes for marshmallow fondant and built up some courage. I wanted to use my stand mixer instead of kneading by hand because I’m all about finding more efficient ways to do things lazy. So I grabbed a tub of Crisco, and smeared it all over the inside of the mixing bowl and on the dough hook. Then it went basically like this: in large, microwave-safe bowl, pour a bag of mini marshmallows and a half cup of water. About a microwaved minute later, the marshmallows are melted and ready for powdered sugar. Dump half the bag in. (Side note: do you like my precise measurements? Sorry if not. This is how I roll.) Stir the marshmallows and powdered sugar till combined. Dump the rest of the powdered sugar into the bowl of your mixer. And add the just-mixed marshmallow-y goo. Start mixing on the lowest setting (otherwise it’ll throw all the loose powdered sugar out of the bowl and onto every surface in your kitchen). And just let it do it’s thing. You may need to stop it every now and then to help incorporate some of the powdered sugar thats hiding out in the bottom of the bowl. But it should just take a couple of minutes. Once it’s no longer sticky, you’re ready to go. Start to finish in about 5 minutes. Can’t beat that! I will note that if you’re wanting to add color, it’s easiest to do so at the liquid marshmallow stage. And since I needed a lot of brown for the pirate ship, I used cocoa powder in place of some of the powdered sugar. It tasted like Tootsie Rolls! So much better than anything I’ve used in the past. And it was WAY easier to work with. I’ll never go back.